Just three weeks before we are putting our house on the market, and the rug makes the room look SO much better. Not so much now. Posted December 3rd, 2012 . Would you say the rug really tied the room together? LOL to Dave for his “Big Lebowski” themed comment. 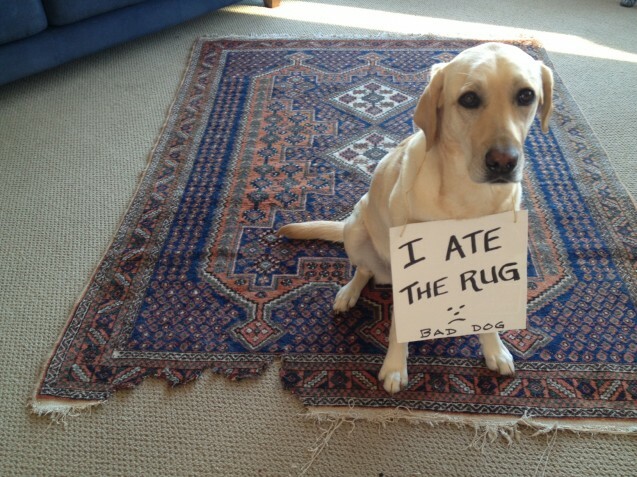 Our Lulu did a similar thing to the carpet runner we had in our dining room to jazz up the hardwood floors. Slide the chewed corner under the couch- that’s what we did when my dog ate MY rug! He just wanted some fiber.